Sea ice also has a fundamental role in polar ecosystems. When sea ice melts in the summer, it releases nutrients into the water, which stimulate the growth of phytoplankton, which are the base of the marine food web. As the ice melts, it exposes ocean water to sunlight, spurring photosynthesis in phytoplankton. 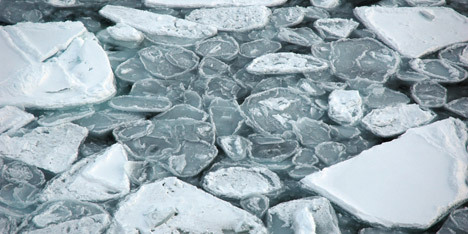 When ice freezes, the underlying water gets saltier and sinks, mixing the water column and bringing nutrients to the surface. The ice itself is habitat for animals such as seals, Arctic foxes, polar bears, and penguins. Salinity is a measure of the concentration of dissolved salts in water. Until recently, a common way to define salinity values has been parts per thousand (ppt), or kilograms of salt in 1,000 kilograms of water. Today, salinity is usually described in practical salinity units (psu), a more accurate but more complex definition. Nonetheless, values of salinity in ppt and psu are nearly equivalent. The average salinity of the ocean typically varies from 32 to 37 psu, but in polar regions, it may be less than 30 psu. Sodium chloride (table salt) is the most abundant of the many salts found in the ocean. Fresh water freezes at 0 degrees Celsius (32 degrees Fahrenheit), but the freezing point of sea water varies. 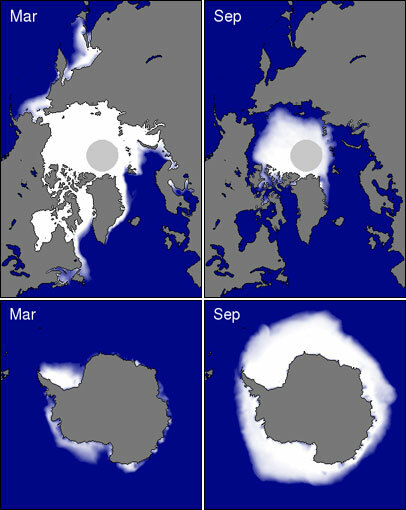 For every 5 ppt increase in salinity, the freezing point decreases by 0.28 degrees Celsius (0.5 degrees Fahrenheit); thus, in polar regions with an ocean salinity of 35 ppt, the water begins to freeze at -1.8 degrees Celsius (28.8 degrees Fahrenheit). When frazil ice crystals form, salt accumulates into droplets called brine, which are typically expelled back into the ocean. This raises the salinity of the near-surface water. Some brine droplets become trapped in pockets between the ice crystals. These droplets are saline, whereas the ice around them is not. The brine remains in a liquid state because much cooler temperatures would be required for it to freeze. 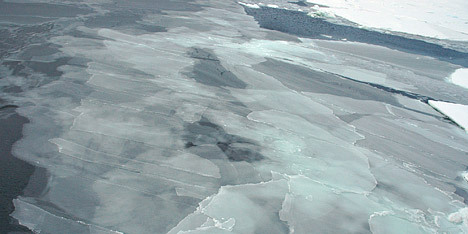 At this stage, the sea ice has a high salt content. 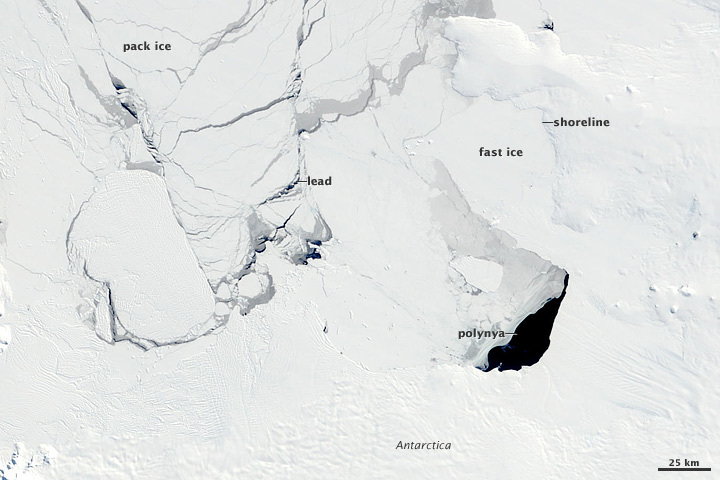 Over time, the brine drains out, leaving air pockets, and the salinity of the sea ice decreases. Brine can move out of sea ice in diferent ways: Aided by gravity, the brine migrates downward through holes and channels in the ice, eventually emptying back into the ocean. 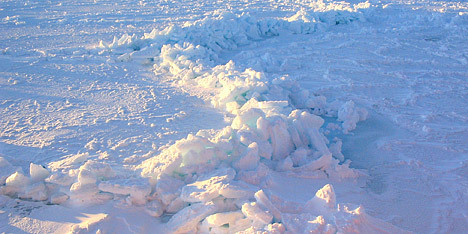 The ice surrounding the brine compresses and breaks the brine pockets, allowing the brine to escape to the ocean. When the sea ice begins to melt during the summer, small freshwater ponds (called melt ponds) form on the top layer of the ice. This freshwater travels through the cracks and holes in the ice, washing out remaining brine. When the sea ice surface cools, brine increases in salinity to the point at which it can melt ice at its underside. 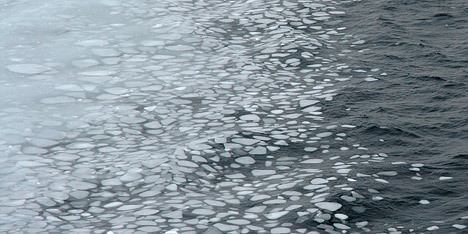 This leads to a downward migration of brine droplets, ultimately allowing the brine to escape into the ocean below the ice sheet. Salt plays an important role in ocean circulation. In cold, polar regions, changes in salinity affect ocean density more than changes in temperature. When salt is ejected into the ocean as sea ice forms, the water's salinity increases. Because salt water is heavier, the density of the water increases and the water sinks. The exchange of salt between sea ice and the ocean influences ocean circulation across hundreds of kilometers.